We'd like ASIO driver support, and the price is a tad steep, but QuickAudio really does make Windows a better place for audio files. Easy to install and use. Waveforms and spectrograms look decent. Handy spotting function. Audio editor is incredibly convenient. Troublesome if your interface can't use WDM and ASIO simultaneously. Quite expensive for what it is. Windows is, arguably, a less convenient operating system for computer musicians than Apple's OS X, which, for example, facilitates instant previewing of audio files directly from the Finder with a tap of the Space bar. To redress the balance somewhat, productivity software specialists Tsugi have come up with QuickAudio, a Windows shell extension that makes some tweaks to the way File Explorer works. QuickAudio does four main things. First, it changes how audio files (WAV, AIFF, MP3, FLAC and OGG formats) are displayed in Windows' File Explorer. The usual icons for the associated application are replaced with the audio waveform or a simple representation of its frequency content, as selected in the Preferences. "QuickAudio is certainly convenient and will no doubt be considered life-changing for some"
Second, it enables previewing of audio files at the press of a key. Third, it gives your PC the ability to export or "spot" audio files directly to certain programs, including several DAWs and game audio middleware applications. 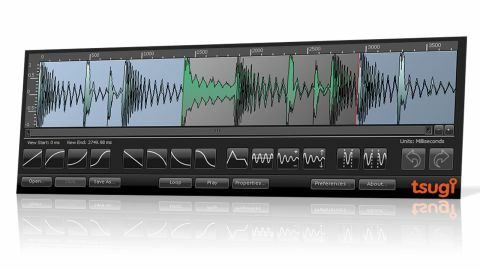 And finally, it features a simple audio editor that can be brought up with another key press and used to quickly apply some basic but useful editing functions. Setup is a snap: simply run the installer and restart Windows. When the system reboots, you'll see the QuickAudio icon in the system tray, and a QuickAudio menu when you right-click a file. Open a folder of audio files, and after a few moments, the waveform graphics appear. The colour scheme of these can be customised quite comprehensively in the system tray icon's Preferences menu, and much like an image preview, the waveforms and spectral displays resize in real-time when you scale the icons. You'll also find that tooltips now display more information about a file's attributes, and that extra information, including metadata, is available in the file's Properties dialog. A major contributor to QuickAudio's appeal is that it allows you to audition the currently selected audio file by pressing a QWERTY key (F12 by default). This isn't quite as slick as OS X's version, simply starting and stopping the audio file playing with no way to skip through it or adjust volume, but it works as expected. Note that if your audio interface can't run ASIO and WDM drivers simultaneously, you may have issues, as QuickAudio keeps the WDM audio port open at all times for instant playback. It's possible to work around this by disabling your audio interface in Windows' Sound Preferences while you're using ASIO, but this is hardly convenient - try the QuickAudio demo to make sure your system plays ball before buying. The spotting function works well and is easy to use. After installation of an add-on via QuickAudio's Preferences, pressing another hotkey places the audio currently selected in Windows on the selected track in your DAW (Pro Tools, Cubase, Nuendo or Reaper) at the playhead position. Game audio developers will also enjoy the ability to automatically create events and other audio objects and export them to Wwise, FMOD Studio and ADX2. QuickAudio is certainly convenient and will no doubt be considered life-changing for some, but the price tag puts it out of impulse purchase territory. If you're interested in making Windows a more audio-friendly OS, though, you definitely need to give it a try via the demo.